Context Follow-up strategies after emergency department (ED) discharge, alias safety netting, is often based on the gut feeling of the attending physician. Objective To systematically identify evaluated safety-netting strategies after ED discharge and to describe determinants of paediatric ED revisits. Data sources MEDLINE, Embase, CINAHL, Cochrane central, OvidSP, Web of Science, Google Scholar, PubMed. Study selection Studies of any design reporting on safety netting/follow-up after ED discharge and/or determinants of ED revisits for the total paediatric population or specifically for children with fever, dyspnoea and/or gastroenteritis. Outcomes included complicated course of disease after initial ED visit (eg, revisits, hospitalisation). 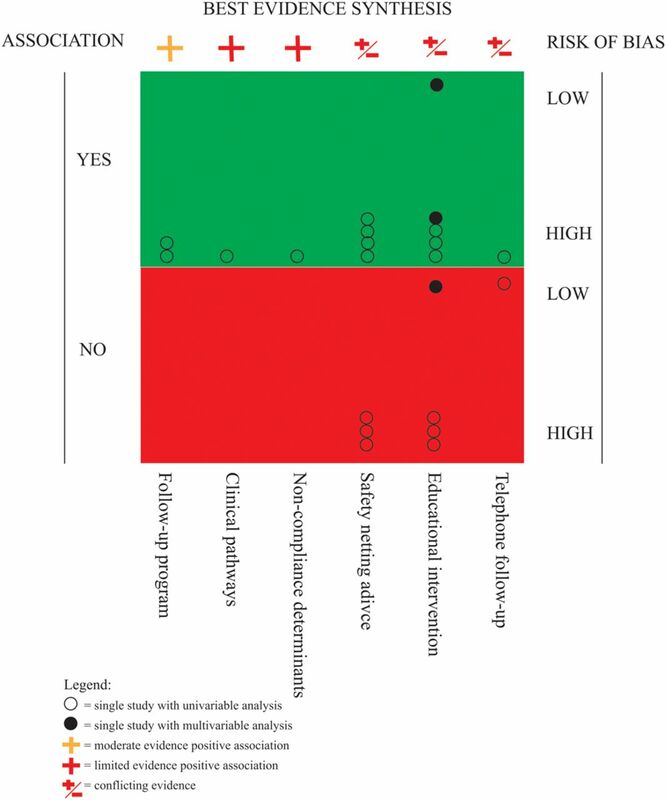 Data extraction Two reviewers independently assessed studies for eligibility and study quality. As meta-analysis was not possible due to heterogeneity of studies, we performed a narrative synthesis of study results. A best-evidence synthesis was used to identify the level of evidence. Results We summarised 58 studies, 36% (21/58) were assessed as having low risk of bias. Limited evidence was observed for different strategies of safety netting, with educational interventions being mostly studied. Young children, a relevant medical history, infectious/respiratory symptoms or seizures and progression/persistence of symptoms were strongly associated with ED revisits. Gender, emergency crowding, physicians’ characteristics and diagnostic tests and/or therapeutic interventions at the index visit were not associated with revisits. Conclusions Within the heterogeneous available evidence, we identified a set of strong determinants of revisits that identify high-risk groups in need for safety netting in paediatric emergency care being related to age and clinical symptoms. Gaps remain on intervention studies concerning specific application of a uniform safety-netting strategy and its included time frame. The importance of safety netting after emergency department (ED) discharge to monitor disease course is well recognised and applied. Evidence-based approaches on this topic are underexposed in literature, since strategies are often based on the gut feeling of the ED physician. It remains difficult to determine high-risk patient groups for whom safety netting is essential. Studies concerning follow-up were mostly conflicting or with limited evidence. Young children, medical history, infectious/respiratory symptoms, seizures and progression/persistence of symptoms were the strongest associated determinants of revisits. When patients are discharged from the emergency department (ED) without definite diagnosis, monitoring children's course of disease to rule out serious infections is mandatory.1 This theme is covered by the term ‘safety netting’, introduced to general practice in 2004 by Roger Neighbour who considered it a core component of general practice consultation.2 Safety netting can be described as a set of procedures or guidelines, which should be followed when a patient is discharged from the ED. This strategy is required in situations with increased risk for serious complications, either in the diagnosis itself (eg, dehydration in patients with gastroenteritis) or if individual patient characteristics are associated with a high risk of complications (eg, significant comorbidity or immunosuppressive therapy).1 Patients who revisit the ED may be regarded as the high-risk population of possible failure of this safety-netting strategy. The importance of safety netting is increasingly recognised in emergency care and literature.3 Healthcare physicians lack standardised safety-netting methods since strategies are often based on the gut feeling of the ED physician,4 and key gaps are described in need of studies on methods and effects of safety netting.3 ,5 Therefore, we planned to systematically review the literature on this important topic. Our first aim was to systematically summarise evaluated safety-netting strategies after ED discharge. Second, we identified children at risk for revisits to improve the identification of children prone to deteriorate after emergency discharge, by studying determinants of ED revisits. Both aims were studied in the total ED population or specifically for children with common illnesses as fever, dyspnoea and gastroenteritis. We considered all types of studies eligible if they reported about safety netting and/or their strategy after ED discharge and extended our search for determinants of ED revisits as a proxy of failing safety-netting strategies. We included studies on the total ED population or specific for children with fever, dyspnoea and gastroenteritis. Studies reporting data on adult and children together as well as studies in low-income countries, due to differences in healthcare organisation, were excluded. Two reviewers independently assessed inclusion (EdV-K and MW); discrepancies were resolved by a third reviewer (RO). Outcomes included complicated course of disease after initial ED visit, mainly dominated by revisits and hospitalisation. We searched the following electronic databases: MEDLINE OvidSP, Embase (Excerpta Medica dataBASE), CINAHL (Cumulative Index to Nursing and Allied Health Literature), Cochrane central register of controlled trials, Web of Science, Google Scholar and PubMed as publisher (searches updated in January 2014) (see online supplementary information 1). We checked the reference list of these papers for additional articles that were not included in the initial computerised search. We retrieved the full text copies of all articles identified as potentially relevant by reviewing the abstracts of search results. Two reviewers’ extracted data on the following: study design, disease/working diagnosis, study population, number of revisits, follow-up period and type of revisit. The determinants were grouped into: child characteristics, social/demographics, disease characteristics, physician and process characteristics. Finally, data on follow-up after ED discharge, including the follow-up strategy, were extracted. 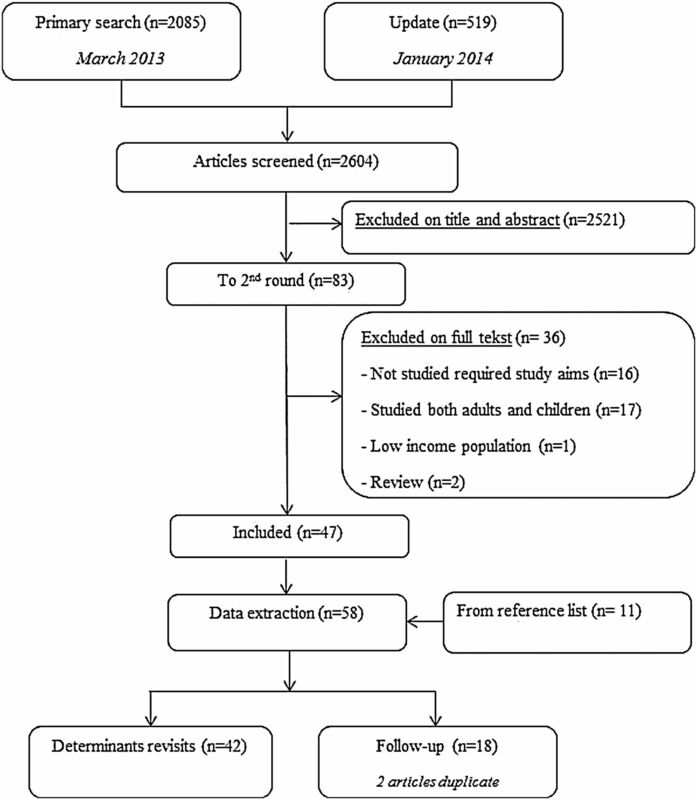 Two authors (EdV-K/DHFG) independently assessed the potential risk of bias of the studies included using the MINORS, a methodological index for non-randomised studies,6 together with the presence of revisits as primary outcome measure and the number of events (see online supplementary information 2). Consensus was reached by the two reviewers (EdV-K/DHFG); otherwise, the independent opinion of a third reviewer was decisive (RO). We performed two separate ‘best-evidence’ syntheses based on the study of van Tulder et al;7 one according to safety-netting strategies and one according to determinants of revisits as meta-analysis of results was not possible owing to heterogeneity in participants, interventions, outcome measures and methodological quality7 (see online supplementary information 2). The literature search identified 2604 references (figure 1). Overall, 36 of 83 full text articles screened for eligibility were excluded on the basis of incorrect study aims, data on adult patients, reviews or low-income populations. Data extraction was performed for 58 articles, including 11 articles added from reference lists. Forty two articles described determinants of revisits, and 18 articles (2 articles duplicate) reported on follow-up after ED discharge (figure 1). Flowchart of the study selection and exclusion stages during the systematic review process. Study characteristics are presented in tables 1 and 2. Included studies were mostly cohort studies (72%, n=42). Fifty two per cent (n=30) of the studies originated from the USA and 19% (n=11) from the UK. Year of publication varied between 1995 and 2013, with 33% (n=19) published in the last 2 years. Most studies (n=34) included all children presented to the ED or the most common paediatric illnesses; 14 studied febrile children and 10 studies reported specific diseases only (eg, gastroenteritis, influenza, respiratory tract infections). Study populations varied between 13 and 568 845 children (median: n=1371) and number of events (revisits or hospitalisation after revisit) varied between 9 and 36 734 (median: n=189). Follow-up period after ED discharge varied between 1 and 656 days (median: 3 days). Most studies (n=29, 50%) described scheduled and unscheduled revisits together; 19 (33%) only measured unscheduled revisits (tables 1 and 2). Online supplementary information 2 shows the potential risk of bias with 36% (n=21) of the studies having low risk of bias. For all studies, the reviewers achieved uniform bias assessment. Ten studies (17%) were scored as high risk of bias because only abstracts were available (nine Congress abstracts and one Spanish abstract). Initial disagreement on 55 out of 880 assessed items (6%) for opportunity of bias was solved by consensus reached by the two reviewers (EdV-K/DHFG) or by the decision of a third reviewer (RO). Figure 2 presents an overview of the different safety-netting strategies evaluated in the included studies (n=18) and the corresponding level of evidence as identified by the colours of the plus/minus signs, according to the best-evidence synthesis (details in online supplementary information 3a and 3c). Level of evidence safety-netting strategies according to the best-evidence synthesis. Figure 3 presents an overview of all determinants of revisits described in the included studies (n=42), their association with revisits and the corresponding level of evidence, according to the best-evidence synthesis (details in online supplementary information 3b and 3c). Level of evidence determinants of revisits according to the best-evidence synthesis. Limited evidence was observed for different strategies of safety netting, with educational interventions being mostly studied. Identified determinants of children at risk for revisits included young children, relevant medical history, infectious/respiratory symptoms or seizures and progression/persistence of symptoms. No association with revisits was found for gender, emergency crowding, physicians’ characteristics and diagnostic tests and/or therapeutic interventions at the index ED. For other described determinants, no statement was possible due to conflicting evidence. The development of evidence-based strategies of safety netting is a challenging new topic. Available studies describing revisits of the ED population and their characteristics vary in populations, study aims and methodology. 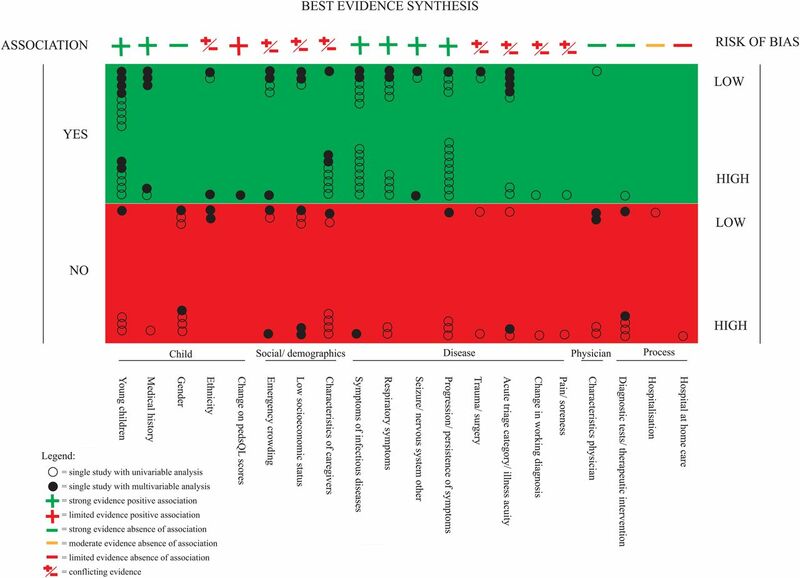 The main strength of this systematic review is combining all information on determinants of revisits using a best-evidence synthesis. Most studies about safety netting are rather descriptive, and did not study their effectiveness.1 ,5 In our review, we summarised the literature that evaluated the clinical consequences of their safety-netting intervention. This review has some limitations. Because of the heterogeneity of the studies, we could not perform a meta-analysis. This systematic review is limited to the provision of whether there is evidence for a significant association or not. This approach limits the interpretation and clinical relevance of the reported associations, but is a consequence of the large heterogeneity of present studies on this topic. Second, there is no standardised risk-of-bias assessment method for the variation of study designs and outcomes included in this systematic review. To overcome lack of general accepted thresholds determining the study's risk of bias, and to include relevance to the research question on the risk-of-bias criteria,65 we used the MINORS risk-of-bias criteria.6 We added two important items, which would be the most appropriate for our included studies. With this approach, we aimed to perform best available systematic risk-of-bias analysis. We classified determinants to ‘strong evidence’ on the presence of low risk-of-bias studies, although high risk-of-bias studies may also have studied the same determinants (see online supplementary information 2). Furthermore, there are limitations embedded in the study design of the included studies itself. The majority of studies are analysed with univariable statistical approaches, with only 35% (20/58) of the studies using multivariable statistical analysis. It remains unknown to what extent the determinants are independently associated with revisits. Second, although we followed the focus of most studies by defining ‘revisits’ as proxy for high-risk populations of failed safety-netting strategies, hospitalisation after revisiting the ED is probably the most effective outcome to evaluate this topic. However, study of this outcome is limited due to its low prevalence. Third, some study characteristics increased heterogeneity between our different determinant categories. For example, determinants were not always specified, for example, ‘history of illnesses’ was not further described in the study of Maguire et al. Furthermore, outcome measures were not homogenous and included, for example, revisits or admission after revisit. Finally, study comparisons varied between revisits versus total ED population or subgroups of revisits (discharged vs admitted children). Determination of a high-risk group in need for safety-netting strategies in paediatric emergency care remains difficult. We identified a set of strongly associated determinants of revisits that could be used for this identification; being young children, relevant medical history, infectious/respiratory symptoms or seizures and progression/persistence of symptoms. Gaps remain on intervention studies concerning specific application of a uniform safety-netting strategy and its included time frame. We gratefully acknowledge Wichor Bramer, medical librarian at the Erasmus University Rotterdam, for assisting us with the systematic literature search for this systematic review.
. The inner consultation. Oxford: Radcliffe Publishing, 2004.
. The parent perspective on return emergency department visits. J Invest Med 2013;61:678.
. Unscheduled return visits for gastroenteritis to a pediatric emergency department. Pediatric Research 2004;55:129A.
. Unscheduled re-attendances to a paediatric emergency department: an audit. Emerg Med J 2010;27:A9–10.
. Characteristics of patients and families who make early return visits to the pediatric emergency department. Open Access Emerg Med 2013;5:9–15.
. Hospitalization rate and diagnosis severity increase on children's return visits to the ED. Acad Emerg Med 2012;19:773.
. The association between parental language and 72-hour revisits following pediatric emergency department discharge. Acad Emerg Med 2013;20:S188. Contributors EdV-K substantially contributed to the conception and design of the study. She participated in the literature search and assessed studies for eligibility. She undertook data extraction, risk-of-bias assessment and performed the best-evidence synthesis. She drafted the initial manuscript, and approved the final manuscript as submitted. DHFG substantially contributed to the conception and design of the study, and reviewed and revised the manuscript. She participated in the risk-of-bias assessment, and approved the final manuscript as submitted. MW participated in the literature search, and assessed studies for eligibility. She reviewed and revised the manuscript, and approved the final manuscript as submitted. HAM substantially contributed to the conception and design of the study. She reviewed and revised the manuscript. She participated in discussion about each step of the results, and approved the final manuscript as submitted. RO substantially contributed to the conception and design of the study. She reviewed and revised the manuscript, and approved the risk-of-bias assessment and best-evidence synthesis analyses. She participated and supervised the discussion about each step of the results, and approved the final manuscript as submitted. Funding EdV-K is supported by ZonMW, a Dutch organisation for health research and development. The study sponsor had no role in study design; in the collection, analysis and interpretation of data; in the writing of the report or in the decision to submit the paper for publication.